In the nineteenth century, before the advent of the welfare state, those who could not afford to look after their own needs in times of unemployment, sickness or bereavement had to look to the poor law system. However, even those who were in regular work often had difficulty in coping with hard times, and to protect themselves huge numbers of the working classes combined in self-help groupings. Friendly Societies had existed from the seventeenth century1, but two groupings which came into existence early in the nineteenth century were to dominate the movement for over a century. The Oddfellows were founded at Manchester c.1810 and the Foresters, centered in Leeds, emerged about the same date. They expanded by the creation of new Lodges (Oddfellows) and Courts (Foresters) in adjoining areas. By 1872 the Manchester Unity of Oddfellows had a membership in excess of 400,000 and the Ancient Order of Foresters had just under that figure: the third largest, the Grand United Order of Oddfellows was a good deal smaller with just over 71,000 members. The great majority of members of the two principal affiliations were to be found in Lancashire and the West Riding of Yorkshire. Schisms and local groupings led to the establishment of a number of bodies of Oddfellows as well as Druids, Shepherds and other bodies. The initial objectives of the movements were to provide weekly sums in cases of sickness, and lump sums on bereavement to meet funeral costs2. Additionally, however, there was a strong social side, the regular meetings invariably being held in public houses, often in a special Lodge room. To increase the sense of identity the bodies had rules and procedures similar to the principal secret society, the Freemasons, involving initiation, ritual and passwords. A feature of initiation into the Foresters down to 1843 was combat by cudgel! The earliest of the orders to have had a presence in Lindley is thought to have been the Ancient Order of Foresters whose Mount Hermon court is said3 to have been founded in 1827. There is some doubt about that date as a report4 of celebrations in 1852 noted that it was the twenty-second anniversary.The court prospered; in 1880 it built sixteen cottages in Baker Street and Wellington Street5 and in 1891 a further eight houses and a Lodge room in Wellington Street6. The latter may still be seen (photographed here) with the inscription 'Foresters Hall 1891'. Before they had their own property the Foresters had met in local public houses: the Fleece in 18527, the Albion in 18688. The Lily of the Valley Lodge of the Ancient Order of Grand Foresters which celebrated its twenty-second anniversary in 1868 at the Angel Inn, Royds Hall9, may have served Quarmby. There were several lodges of Oddfellows in the area. In 1855-56 Lodge 158 of the Oddfellows, apparently based at Birchencliffe, purchased six cottages when the Thornhill estates were dispersed10. In 1868 between forty and fifty members of an Oddfellows lodge had their annual gathering at the Saddle Inn; forty members of a lodge of the Bolton Unity held their anniversary at the Bay Horse; between thirty and forty celebrated the anniversary of their lodge of the Manchester Unity at the Albion and some sixty members also of a Manchester Unity lodge dined at the Red Lion11. The latter lodge was valued at over £13 per member and was able to record that it had paid more for sick members than in any previous year12. The Druids society which appears to date from the same period as the Foresters and Oddfellows also had a strong presence in the village. In 1842 the Linley Pride Lodge of Ancient Druids No. 229 had a church parade from the Fleece Inn13. In 1854 the National Anthem Lodge of the Modern Druids held their anniversary at the Old Black Bull14. Lodge 375 is noted15 at the Fleece Inn in 1865 whilst one hundred members of Lodge 461 of the Ancients celebrated their anniversary16 at the Saddle Hotel in 1873. It seems almost that every public house hosted one or more of the societies, and certainly Lodge nights and anniversaries would provide welcome trade. Another area of self-help was the Burial Society or Club. Locally we have detailed knowledge17 of the Zion Sunday School Funeral Society which was established in 1855. Entry was restricted to scholars and teachers of the Sunday School who were aged between five and thirty-five. They paid 4d. on entry and 2d. a quarter, the benefit on death being £2. As the Society prospered the benefit was increased: to £2 10s. 0d. in 1878; to £3 in 1886. 1894 saw the introduction of a sliding scale of benefits related to length of membership: £3 up to ten years; £3 10s. 0d. up to twenty years; £4 up to thirty years; £4 10s. 0d. up to forty years and £5 above forty years. 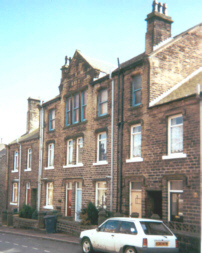 In the 1880s the accumulated funds were loaned for the building of ministers' houses at Paddock and Golcar, and by the end of the century they stood at just under £800. 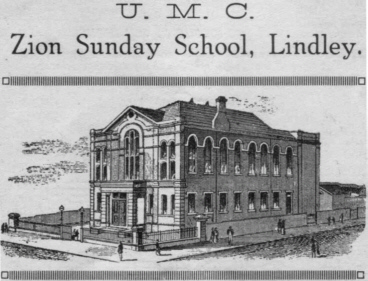 A burial society was also run in connection with Lindley Parish Church: it too had started as a Sunday School organisation, in 185918. The author remembers the windfall of some £2 or £3 which came to him when the society was finally wound-up. Oakes Sick and Burial Society was conducted by Oakes Baptists from 1869 to 1913, in which year the National Insurance Act came into force19. 1 The information in this paragraph is drawn from: P H J H Gosden Self-Help Voluntary Associations in 19th Century Britain. 5 West Yorkshire Archives, Kirklees, Building Plans Register, Lindley District 1868-86, No.353. 6 Huddersfield Weekly Examiner 14.2.1891. 10 West Riding Registry of Deeds, Wakefield TK 421 515; TK 436 530. 17 West Yorkshire Archives, Kirklees KC 84/20. 18 Verbal report at the time of winding up. 19 The Oakes Baptist Church, Lindley, Huddersfield, 1864-1964: Centenary Celebration Souvenir.